Obama claimed in his State of the Union speech that his focus would be on jobs. Really? President Barack Hussein Obama had the audacity last week when the new jobs report was released that we are headed in the right direction. Some one in the MSM might have wanted to ask Obama, just what direction he considers the right direction, a recession? 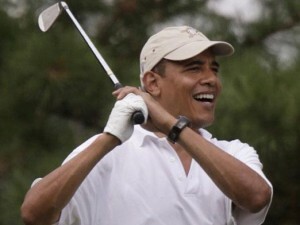 With all the signs leading to a double dip recession,President Barack Hussin Obama is partying like it’s 1932. “Home sales are down. Retail sales are down. Factory orders in May suffered their biggest tumble since March of last year. So what are we doing about it? Less than nothing,” he said. Barack Obama passes the buck rather than the Buck stops here. “I don’t need to remind any of you about the situation we found ourselves in at the beginning of this year,” Obama told people at a Home Depot stop last month. And then he reminded them anyway, detailing a nation in financial free fall when he took office. Never has there been a President of the United States who so blamed others for all the ills of his Presidency than Barack Hussein Obama. The lack of leadership and personal responsibility can only come from one who’s claim to fame is being a community organizer. The time has come for this President to stand up and take responsibility for his actions, policies and the state of the United States. A Presidents job is to lead, not lay blame on the previous administration. Sadly, when it comes to Barack Hussein Obama, it is all about Bush. Obama campaigned as not being Bush and since being elected he has never taken responsibility for his actions as President. Barack Hussein Obama campaigned for a job that he knew what the consequences were and what he was getting in to. What President does not inherit the good and the bad of a previous administration? Is this really the right message to be sending We the People? 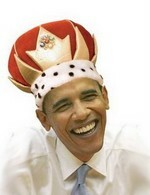 While Americans are suffering, out of work and losing their homes could Obama maybe down play the pomp and circumstance? Nope! Image and perception is everything and Obama has truly proven he is out of touch with the American People. Hope and Change, eh? With unemployment at 10.2% and rising, really at 17.5%, joblessness rising in 29 states, federal deficits out of control and Obama and Dems looking to pass Obamacare and Cap & Trade that will all but destroy out economy, raise taxes during a recession and blow out our US debt for generations to come and now one in four borrowers are underwater in their mortgages owing more than the value of their property, let alone the foreclosures still occurring … Obama wants to have a party. Can we all just see the hypocrisy in this? It is hardly the time or the place while millions of Americans are out of work and The irony of the first black President being elected is that 34.5% of joblessness in October were black men from the ages of 16 to 24. How are you liking that “hope and change” now? Joblessness for 16-to-24-year-old black men has reached Great Depression proportions — 34.5 percent in October, more than three times the rate for the general U.S. population. And last Friday, the Bureau of Labor Statistics reported that unemployment in the District, home to many young black men, rose to 11.9 percent from 11.4 percent, even as it stayed relatively stable in Virginia and Maryland. 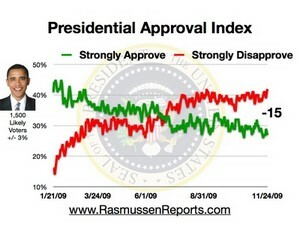 One year into his Presidency and Barack Obama has hit an all time low in the Rasmussen Daily Presidential tracking poll. OUCH, -15%!!! Thus, we can see why Obama and his cronies are at an all out pass Obamacare at all cost as they know the ship is sinking and they are sacrificing us all as they go down in flames. What else could be the motivation behind this Kamikaze approach to drive Obamacare down the throats of Americans when now only 38% approve of it while 56% oppose. Of course a majority of Democrats will strongly approve, 52, and an overwhelming majority of Republicans strongly disapprove, 68%, of Obama. However, it is the unaffiliated voter that should scare the daylights out of Obama and Democrats. Among those not affiliated with either major political party, just 16% Strongly Approve and 51% Strongly Disapprove (see other recent demographic highlights). Trust me, “We the People” are paying attention and you will all pay a severe price in 2010 and 2012 when we rid ourselves of this colossal social experiment. US UNEMPLOYMENT RATE REACHES 9.8% … Stimulated Economy? The US lost another 263,000 jobs in September, much higher than expected as the national unemployment rates rises to 9.8%. Analysts polled by Reuters had expected non-farm payrolls to drop 180,000 in September. The unemployment rate is the highest in 26 years. So does Barack Obama and Joe Biden wish to sing the praises of the stimulus package again? U.S. employers cut a deeper-than-expected 263,000 jobs in September, lifting the unemployment rate to 9.8 percent, according to a government report on Friday that fueled fears the weak labor market could undermine economic recovery.